Stevens Memorial Hall was given as a bequest from George Washington Stevens, in honor of his wife, and built in1910. Originally it was the town hall, with the selectmen’s office, the library and a meeting hall on the first floor. Many organizations held meetings and suppers in this hall. The big meeting hall upstairs has a stage and town meetings and plays were held there. Stevens Memorial Hall is a nearly unaltered, two and one-half story, wood-frame, Queen Anne Style civic building, with a modified rectangular plan, raised granite foundation, and a bracketed, slateclad hipped roof with dormers and chimneys, dedicated in 1910. Designed by George G. Adams, Architect, of Lawrence, MA this transitional, Colonial Revival-influenced property originally consisted of two, detached buildings and was situated amidst an enclave of the Town of Chester’s most important historic public buildings, private residences and sites, which spanned the 18th-20th centuries. 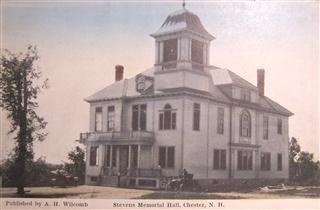 Stevens Memorial Hall, placed adjacent (south) of the site of the former Chester Academy, (one floor of which had served for decades as the hall for town meetings) , and as the last entrant to this ensemble of distinguished structures, exerts its architectural presence as the Town’s principal governmental/civic structure in a restrained, yet dignified manner. Stevens Memorial Hall retains integrity of its original location at the crossroads known as Chester Center, the traditional civic, governmental, religious and commercial center of this early 18 th century community; through its intact exterior and interior design, which typifies the town hall and opera house building form popularized during the late 19th century; prominent public setting; use of original early 20th century materials; and expression of quality workmanship. The building continues to convey the feeling and association of neo-classical formality, as the community’s principal civic and governmental edifice.